Lace appliques decorate the bodice of Coral, which is so sheer it appears to blend right in with the skin for an absolutely ethereal look. The dreamy nature continues with the sheer organza of the A-line skirt, and the illusion bateau neckline is balanced by a dropped waist silhouette. 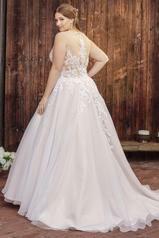 The illusion back is decorated with gorgeous trailing appliques.